I believe my exact words when discussing the possibility of reviewing Gundam Unicorn Episode 6: Two Words, Two Tomorrows were, "I will crawl over Richard's corpse to review this." As I've stated before, I am a huge Gundam fan. While I was initially against the idea of expanding on the Universal Century timeline any further, after watching the first few episodes of Gundam Unicorn my opinion was turned around 180 degrees. It is truly a series made by a Gundam fan, for Gundam fans. Now it's at the point where I just can't get enough. The Blu-ray for Episode 5 was the top selling Blu-ray disc in Japan last year, so apparently I'm not the only one. Brace yourselves. I&apos;m about to give some people a migraine from rolling their eyes too hard. That being said, since I earned the privilege to review Gundam Unicorn Episode 6 (by threatening a fellow writer), I've done my best to place my personal feelings aside and view the movie as a movie and discern what works about it and what its faults are. While Two Words, Two Tomorrows is overall a well-made solid piece, it is not without its imperfections. Let's get this part out of the way first: The technical quality of Gundam Unicorn has been superb throughout the series. It looks beautiful, the animation quality is top notch, the voice acting is captivating (at least the Japanese is), and let's not forget the unforgettable soundtrack by composer Hiroyuki Sawano (Do yourself a favor and do a YouTube search for "gundam unicorn soundtrack mobile suit"). An amazing amount of work and care has gone into making the series look and sound absolutely spectacular and in terms of sheer aesthetics, Episode 6 is no different. One of the main plot points of Two Worlds, Two Tomorrows is that two opposing sides have been forced to cooperate for a mutual goal. The result is a tumultuous cocktail of emotions. All of the characters are fleshed out and you end up being able to relate to almost all of them. Even the ones you can't relate to, you are at the very least able to understand where they are coming from. Almost every character gets their moment to shine in the spotlight, which results in a high level of emotional investment on the side of the viewer. Mixed —Now It's Time for Exposition! There is very little action throughout the movie. If you've gone and watched the first 7 minutes of the movie and thought you were in for an action-packed thrill ride, well, sorry. The first 7 minutes is the majority of the action you're going to get. Granted, as I mentioned, this is the explanation episode; so the main focus is getting you up to speed on what's going on to prepare you for the leap into the final conclusion, rather than getting your adrenaline rushing. That's not to say there isn't any tension or drama, but the movie seems to deliberately tease the possibility of a fast-paced, high-octane action sequence on several occasions, only to pull back and end the scene, leaving you with blue action-balls. Bad —You're Doing This Because of What? Perhaps the weakest point of the movie (and we're entering heavy spoiler territory now) is the character of Riddhe Marcenas. At the end of Episode 5 it was pretty obvious that Riddhe would be the next pilot of the Banshee, and what do you know, in Episode 6 he's the pilot of the Banshee. But now he's gone to the Dark Side with a dark pilot suit, long bangs, and a constant sour look on his face. While I could understand his anger and frustration at the end of Episode 5 after getting dumped by Mineva, (Seriously, if a girl chooses to jump out of an airplane without a parachute rather than go with you, you don't exactly need Doctor Nerdlove to explain to you just how hard you got dumped.) his complete and utter transformation into Emo Riddhe in Episode 6, out to exact vengeance on Banagher, feels forced and artificial. Overall, Gundam Unicorn Episode 6: Two Worlds, Two Tomorrows is light on the action, but still manages to be an emotional drama that draws you in and gets you pumped for the final chapter that is to come. The story is very much an addition to an already existing canon, and so it is advised that people watch the other series from the Universal Century timeline of the Gundam Multiverse, or at the very least, do a little research to get up to speed. At the end, though, despite what weaknesses it may have, Episode 6 once again proves that Gundam Unicorn is a must-see series for any Gundam fan. 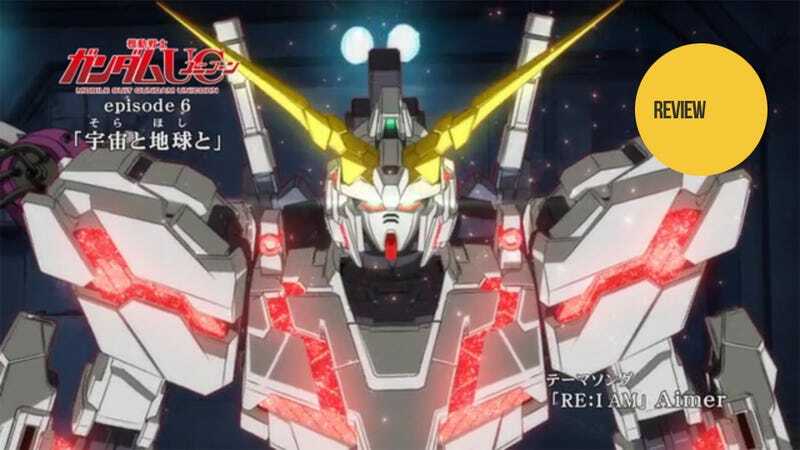 Based on the 10-part novel series by Harutoshi Fukui, a long-time fan of the original Gundam's creator, Yoshiyuki Tomino, the Gundam Unicorn anime was initially planned as a 6 episode movie series which was extended to 7 episodes in an announcement at the premiere of Episode 5 last year. Fukui has confirmed that Episode 7 will be the conclusion to the series, although the sheer amount of content ensures that the final chapter will be well over an hour long. While most anime are divided into an A part and a B part, according to the newly completed storyboards from director Kazuhiro Furuhashi, Episode 7 has so much content it requires an additional C part. Episode 7 is slated for a Spring 2014 release, but according to Fukui, "[Looking over the content] some of the staff were questioning if we could actually make it in a year." It's a long wait until next year, but I'm already excited for the final conclusion to what has turned out to be an astounding series. Gundam Unicorn Episode 6: Two Words, Two Tomorrows is currently playing in limited theaters in Japan, and is available for digital rental on the PlayStation Network and on Zune on Xbox LIVE. The Blu-ray is scheduled for release on March 22nd.